Texas Parks and Wildlife Foundation (TPWF) is encouraging Texans to get involved in conserving the wild things and wild places of our state. “We Will Not Be Tamed” calls you to appreciate the wildness of Texas, the vastness of our Texas spirit, and why we should be inspired to conserve it. As the official nonprofit funding partner of Texas Parks and Wildlife Department, TPWF supports projects to conserve the lands, waters, and wildlife we all love. As part of the new public awareness campaign, TPWF has teamed up with popular Texas brands to give away everything you need to Live the Wild Life. 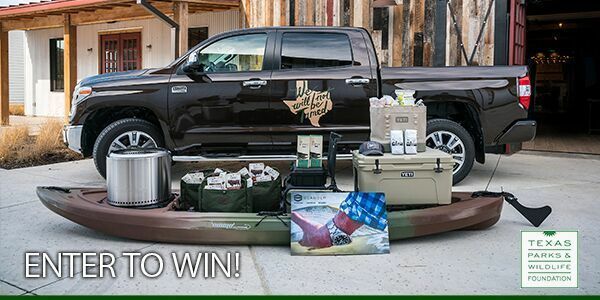 Partners including Toyota, Yeti, Howler Brothers and Diablo Paddlesports have created a one-of-a-kind sweepstakes, and the grand prize winner will drive home in a new Toyota Tundra.